Sirocco is no wind of change and rushing things is not really the Mediterranean way. It makes perfect sense then that the Nokia 8 Sirocco comes out with last year's chipset and what's now considered an old-school 16:9 aspect display. That's everything old about it though - well, that and, obviously, the name lifted off of one of the special editions Nokia 8800s from the mid-noughties. 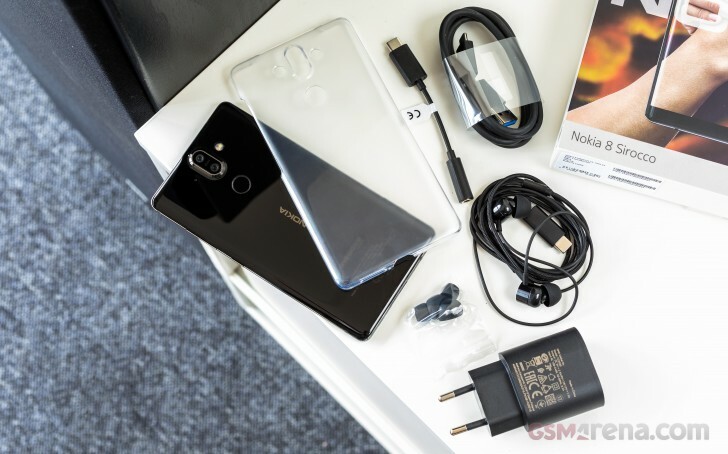 The Nokia 8 Sirocco is more than a little different from the plain 8 that's been out for some 8 months now. A dual-curved 5.5-inch OLED display replaces the 5.3-inch LCD and that comes in an IP67 certified all-glass body, compared to the 8's aluminum backed construction with an IP54 rating. A new camera setup now includes a large dual pixel primary 12MP sensor in place of the smaller 13MP one on the Nokia 8, and what was a monochrome camera on the 8 is now a telephoto instead. The combo should be mostly the same as the one found on the 7 Plus, but with OIS added in the mix. One could see it as a downgrade that the 8 Sirocco's front camera can't record 2160p videos (the one on the vanilla 8 can), but this 5MP selfie shooter's large pixels promise better low-light images. A minor bump in battery capacity means the Sirocco comes with a 3,260mAh cell instead of the 8's 3,090mAh, but the extra capacity has eaten up the room for a microSD slot. Or the two are entirely unrelated - either way, the internal storage (an otherwise roomy 128GB) is not expandable. Nope, there's no headphone jack on the Nokia 8 Sirocco - apparently, true flagships can't have one. There's a solution waiting inside the box, so at least there's that. A USB-C to 3.5mm adapter can be found in the bundle in case you want to plug in your own wired headphones. Alternatively, you can use the provided earbuds which connect directly over USB-C.
A QuickCharge AC adapter (up to 18W) is included as well as a USB-A to USB-C cable. That's not all though, there's also a semi transparent bumper case made of hard plastic. So hard that we struggled to remove it once it's snapped on, but that's better that it coming off on its own. You might want to risk it and refrain from using it, and we'd understand - join us on the next page where we admire the Sirocco's looks.